Weather permitting there will be a 434 MHz pico balloon launched from Bristol on Tuesday, February 28 at 0830 GMT. This launch is using a 1.5m envelope and the attempted float altitude will be about 12 km. The payload is a new tracker design that uses an AX5043 radio. It will be transmitting pips, RSID and Contestia 16/1000 on 434.635 MHz USB, once every two minutes. Callsign “UBSEDS23”. Between the Contestia transmissions the AX5043 radio will also be used to transmit GMSK at 24 ksymbol/s, centered on 434.637.5 MHz. It’s 4×4 interleaved, R=1/2 convolutional K=5, HDLC framing, whitened etc. as per the AX5043 manual. This is concatenated with RS(255,223) to mop up some burst errors. IQ recordings of this might be useful so that the data can be extracted once a software decoder exists. Callsign “UBSEDS23G”. A UK student built balloon carrying APRS and 434 MHz payloads is expected to complete its 2nd circumnavigation of the northern hemisphere on Tuesday afternoon . The solar powered UBSEDS18 was developed by students at Bristol University and launched on Wednesday, August 17. Since then it has traveled in an easterly direction for over 62,000 km and is expected in the Bay of Biscay off the New Aquitaine coast on September 20. The inovative balloon utilizes a LIC1235R 40F li-ion supercapacitor to enabled continued transmission after sunset. The UK balloon UBSEDS18 carrying payloads for APRS and 434 MHz has successfully crossed the Pacific, on the same day a USA amateur radio APRS balloon crossed the Atlantic. The solar powered UBSEDS18 was developed by students from Bristol University and launched on Wednesday, August 17. Since then it has traveled in an easterly direction for 20,252 km completing the Pacific crossing on Thursday, September 1, 2016. The amateur radio APRS balloon CNSP30 was launched from California on August 25 and on September 1 crossed the coast of northern France. Its APRS signal was receivable across central and southern England. On Monday, March 21, 2016 the UBSEDS14 balloon, launched by University of Bristol students, completed its circumnavigation of the Northern Hemisphere. The University of Bristol Students for the Exploration and Development of Space (UBSEDS) launched their balloon on Monday, March 8. Powered by a single AA Lithium Energiser Battery (LR91). During the flight at an altitude of about 11,500m the balloon has been transmitting telemetry data at 4 minute intervals using 5 dBm output of Contestia 16/1000 on 434.600 MHz USB. Each telemetry packet is preceded by 10 seconds of 1Hz pips for manual alignment and a RSID tone for automatic alignment with suitable software. Additionally the payload has the capability for 144 MHz APRS. The balloon has a diameter of 1.5m and the payload weighs just 21.3 grams. 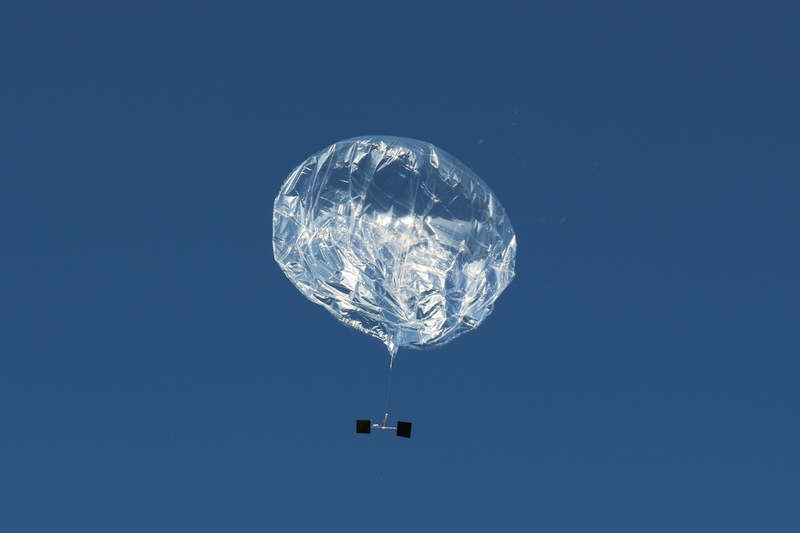 Despite the weight constraints the team have managed to employ sophisticated Geofencing technology to prevent the balloon transmitting when over certain countries and also to select different APRS frequencies depending on the territory being overflown.